Welcome to Natural History of the Kitchen, by EMD's Stephanie Butler. Each week, Stephanie explores the background of an appliance, gadget or product that helped to make cooking what it is today. This week: Popcorn. Since last week we took a look at microwaves, it seems right that this week the spotlight shines on a product that folks know mainly in microwaved form: popcorn. It's been much more than a movie treat for thousands of years, used as currency, for soup and beer, packing materials, and jewelry. Whether you take yours with extra salt, light on the butter, or au naturel, there are popcorn facts for all tastes in this week's Natural History of the Kitchen. 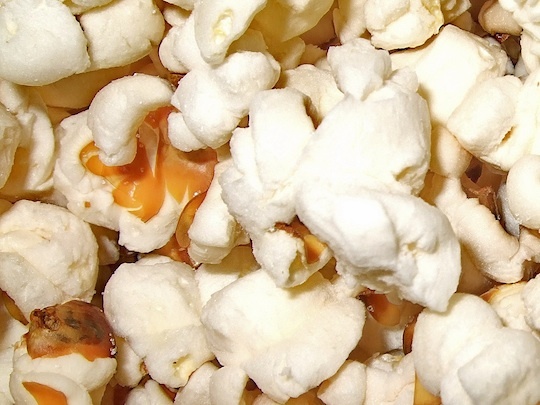 Estimates vary, but most anthropologists agree that popcorn got its start in South America around 5,000 years ago, and it's been popular ever since. Spanish conquistadors have detailed records of Aztecs popping corn, even going as far as mentioning the specific rituals in which the corn was used. Farther north, Pilgrims loved popcorn so much that they ate it for breakfast with cream and sugar, creating low-tech Corn Pops years before General Mills. Pushcart vendors sold bags on corners in large cities, and the first self-powered machine was patented in 1893. It popped corn in a mixture of lard and clarified butter, sturdy fats that were able to resist the high temperatures needed to explode kernels. Popcorn was still a street treat up until the Great Depression, when its low cost made it the snack of choice for thousands of unemployed Americans. Enter the microwave. Up until the 1980s, stove-top popping pans and electric poppers were the main option for popping corn. It was tasty, sure, but also messy and decidedly old fashioned. Popcorn was a go-to test food for the early microwave scientists at Raytheon, but it took nearly 40 years before scientists at General Mills finally figured out a way to cook corn in a way that minimized unpopped kernels (or "old maids") and also kept popcorn from scorching. Microwave bags have a special device called a susceptor laminated inside the bag. Normally placed underneath the oil and seasoning packet in a bag, this metal film melts the fats, coating the corn as it expands. The bags make popcorn popping quick and easy, but come with some very serious (albeit rare) health consequences. In 2007, a Colorado furniture salesman went to his doctor complaining of shortness of breath. He was overweight, but had never smoked, and seemed to not have any of the risk factors associated with advanced lung disease. Doctors were puzzled until one realized that the man's test results were consistent with those of popcorn factory workers in the Midwest. In the 1990s eight workers had come down with severe asthma-like symptoms: the airway obstructions and scarring became so severe that a number of these workers were placed on lung transplant lists. The Wyandot Popcorn Museum in beautiful Marion, OH. 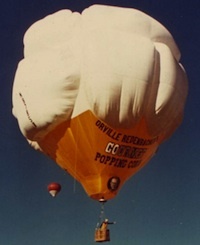 A site dedicated to perhaps the catchiest tune ever played on a Moog synthesizer, Gershon Kingsley's Popcorn. Warning: you will be not able to get it out of your head. More information about the Colorado popcorn lung case. I'm seriously craving some popcorn now. I love making popcorn at home. All I use is a big stock pot, heat up a 1/4 cup of olive oil, add a couple of kernels of corn to check for temperature, then add a 1/2 cup of popping corn when the test kernels explode. Vent the lid by leaving it slightly askew (and away from you), and use a towel on a handle to move the pot back and forth over the stovetop to prevent burning. I learned a trick on Good Eats a while back. You can make your own microwave popcorn, with a paper lunch bag, popcorn (enough to cover the bottom of the bag), a bit of oil, salt and that's it. add all the ingredients. Shake to coat. Fold over top of bag, and pop. It's an awesome quick, chemical free way to make popcorn. And then you can compost the bag when you are done. For people who have food restictins, you can skip both the oil and salt. Just the paper bag and popcorn are enough. It's a food miracle.